Azoteq, the world leader in proximity and touch solutions, today announced the release to market of the IQS211. 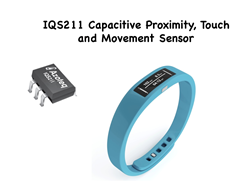 The IQS211 is the first low cost proximity controller with movement detection that prevents stuck conditions. The IQS211 offers one self-capacitance channel in a small SOT23-6 package. Proximity wakeup allows for very low power consumption until the user interacts with the product. The outputs can be configured via OTP settings for proximity or movement and touch outputs. The device can operate in standalone, I2C or 1-wire streaming modes. The IQS211 has several modes of operation. In fast response mode the device only draws 80uA and in low power mode only 4 uA while sensing, making it ideal for battery applications. “The IQS211 is the lowest cost capacitive proximity, touch and movement controller available today” said Kobus Marneweck, VP of Marketing. The IQS211 is priced at $0.21 in quantities of 1K. IQS211 samples and production are available from Mouser now. Azoteq (Pty) Ltd (http://www.azoteq.com) is the world leader in proximity and touch solutions for switches, sliders, scroll wheels and touch screens in consumer and industrial applications. Azoteq (Pty) Ltd has design and manufacturing centers in South Africa and China, and sales offices and distributors in South Africa, Asia, Europe and the USA. IQ Switch®, ProxSense®, LightSenseTM, AirButton®, DYCALTM are trademarks of Azoteq (Pty) Ltd.